What are stained glass reinforcing bars, steel braces, or windbar? What are steel reinforcing bars or steel braces in a stained glass window? Lead is a soft metal which is very pliable and flexible. A leaded stained glass window therefore needs extra support. Without the assistance of a strong, hard metal, the leaded window will sag, bow, or bulge due to the force of gravity. Steel reinforcing bars give the leaded window that added support. These steel reinforcing bars also go by the names - steel braces or windbars. Traditionally, the steel braces were made of 1/4" round steel. Wire-ties (or pigtails), which are short lengths of small wire, were soldered to the leaded window. The round steel brace was positioned horizontally, and the wire-ties were tied to it. On the ends, the 1/2" wood stops which are part of the wood frames had holes drilled into them in which the steel braces were placed. If the framing was stone, it may or may not have holes drilled into it as well; many times not. Round steel braces are rarely used today. More expensive 1/8" x 1/2" steel braces are used. (They are more expensive because it cost more to have the round steel bar flattened, which is how they are made.) Instead of having wire-ties, these steel braces are soldered directly to the leaded panel. The 1/2" thickness makes it much stronger that the 1/4" round bar, and much more resistant to bulging outward or inward. An added feature is that the 1/8" makes it less visible as well. On wood frames, the outside wood stops are notched so that the steel brace rests on it. With aluminum frames, the steel braces are notched still allowing the brace to be supported by the aluminum stops. Note that steel braces are placed to the interior of the window. This is for a couple of reasons. One is to prevent rusting. Steel is very prone to rusting when in contact with water. 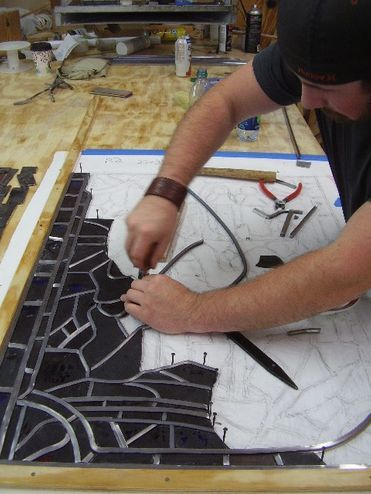 At Laws Stained Glass Studio, we coat our steel braces in zinc to further prevent rusting. The second reason is prevent a shadow caused by the steel brace. By placing the bar on the inside, it will not give a shadow on the glass. The steel braces are part of the window panel, which is not over 15 square feet. Depending on the width of the window, steel braces are usually place about every 9-12 inches horizontally. Sometimes, they are placed vertically at the bottom of a window. At Laws Stained Glass Studios, we even bend the steel braces using an old anvil so that it does not obstruct hands or faces in pictorial windows. For large windows, steel braces are not enough support. Steel or aluminum t-bars are used for tall windows that are not very wide. But for windows over about 48" wide, the window need an aluminum, steel, or wood frame. This photo shows a traditional 1/4" round steel brace (or reinforcing bar). This is a close-up showing the wire-tie (or pigtail). Close-up of the steel braces. Note that one is horizontal and a short is vertical. Also note how the horizontal brace is notched into the wood stop. Here is a wide panel where we added interlocking vertical braces. Photo of the same panel with the interlocking vertical braces.